Preaching the book of Jude is like teaching a child to eat at a table with proper utensils. Just as a child is incapable of getting the proper nutrients that he needs from a dinner plate without using the proper utensils, so a believer is unable to mine the truths of Jude without using the proper tools of biblical hermeneutics and interpretation. As Dr. Paige Patterson has noted, “Good preaching consists in helping people to read the Bible.”Text-Driven Preaching: God’s Word at the Heart of Every Sermon (p. 26). B&H Publishing Group. Kindle Edition. Viewing preaching through this lens requires the preacher to consider how he is teaching his audience to deal with a difficult text like Jude. Though the book of Jude is short, it is filled with verses and imagery that are confusing for average laymen when they read the text. This is where they will need tools for biblical interpretation. When it comes to preaching the book of Jude, there are three “utensils” for biblical interpretation that your audience will need in order to understand the book for themselves: the spoon, the knife, and the fork. Teach your audience to use “the spoon” of biblical interpretation to grasp main ideas in the text. In teaching my young daughter how to use utensils, it has become clear to me that the spoon is the easiest of all utensils to use. A spoon takes what is readily available and easy to pick up, and it allows the person using it easy access to a bite of food. That is why we usually start children off using spoons—it’s easy! With what truth does Jude ultimately want his audience to walk away? Though there may be those who preach a false gospel, Jesus is the only sure foundation. By introducing your audience to this easy-to-access truth, you are actually orienting them to the primary point of the text and providing them with an exegetical key for understanding the rest of the book. Often, the easiest to understand portions of the text contain the main point of the text, and they help inform other passages. Teaching your audience to look first for an exegetical key will help them better interpret a text and apply the truth to their lives. Teach your audience to use “the fork” of biblical interpretation to handle often-misunderstood passages. As the task of training my daughter to use utensils has continued, we have also begun to use the fork. While the spoon goes after the food that is easily accessible, a fork prods, pokes, and even cuts to make other bites of food accessible. The same effort is often required in biblical interpretation. Though there is absolute truth in every word of Scripture, there may be times where prodding or poking the text is necessary in order to uncover the truth therein. This is the case with passages like Jude 5. A cursory reading of this text may lead one to believe that God is casting off those who were at one time part of the faith for their lack of belief. This interpretation is not congruent with biblical theology. God has promised to glorify everyone whom He has justified. Salvation is secure in Christ Jesus, so how does one understand this passage? Well, as Dr. Steven Smith and others have made clear, with an understanding of Jude as a whole, including the truth in the doxology of verses 24-25, Jude is teaching that God will judge all apostasy.Ibid. There will be those who claim to be of the faith, yet they are not, and their teaching and actions reveal this to be the case. It is these who will receive the judgment. Those who have truly placed their faith in the One who can keep them from stumbling, Jesus Christ, have an eternal hope, whereas the apostate can expect eternal judgment. It is valuable for the preacher when preaching these verses to not only teach the truth, but to show how the verse may be or has been misinterpreted. By explaining the possible misinterpretation and giving the proper interpretation, the preacher illustrates for his people how to understand confusing passages and how to reconcile these truths with the rest of biblical theology. Teach your audience to use “the knife” of biblical interpretation on difficult-to-understand passages. When training a child to eat, typically, the last utensil they are taught to use is a knife. The knife is a valuable tool because it takes food that may be tough and inedible and makes it edible. Dealing with difficult texts of Scripture often requires sharp exegesis, just as a meal may require a sharp knife. The book of Jude contains a plethora of passages that are difficult to understand. 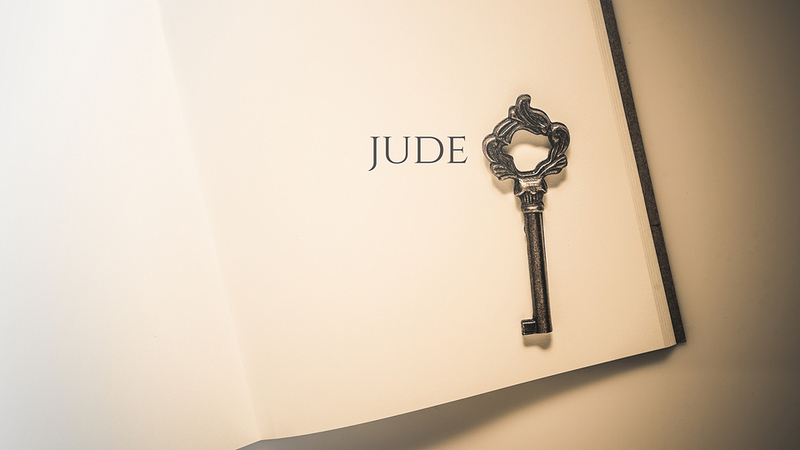 Jude is filled with references to extra-biblical and pseudepigraphal writings that present a challenge to the reader. Is Jude affirming these works as being inspired by God? Are the events that Jude describes factual, or are they purely illustrative? These exegetical challenges may seem insurmountable for the educated preacher; can you imagine how impregnable they may seem for a layperson? Teaching people to read the Bible requires the preacher to demonstrate how they deal with difficult texts and how they deal with matters of inspiration. Just as a knife slices what is edible from what is inedible, so sharp exegesis separates truth from potentially confusing passages. When preaching Jude, do not be afraid to mention the complexities that exist, but do not fail to proclaim the truth that these verses contain. Breaking down passages like this one in Jude requires a knowledge of biblical theology, an understanding of ancient history, and a commitment to biblical inerrancy. When preaching, do your best to provide a clear answer to the questions that may arise from these texts, but do not miss the forest for the trees. Acknowledge the difficulty present in interpretation, but primarily spend time heralding the truth. Though you will not be able to go into all of the background from the pulpit, it may be wise to look for opportunities to go deeper into problem passages with your congregation at another time. Ultimately, the purpose of preaching Jude isn’t just training; it is also feeding. Make sure your congregation walks away full. When preaching Jude—or any text, for that matter—it can be tempting to get so caught up in the exegetical minutia that we forget the eschatological hero. As discussed earlier, Jude’s primary purpose is to laud the power of the Savior who makes us blameless and deserves all honor and glory. Preaching Jude requires us to deal with difficult biblical texts, but it primarily demands that we proclaim the glory of King Jesus and the fullness that can only be found in a relationship with Him. 1. ↑ Text-Driven Preaching: God’s Word at the Heart of Every Sermon (p. 26). B&H Publishing Group. Kindle Edition.